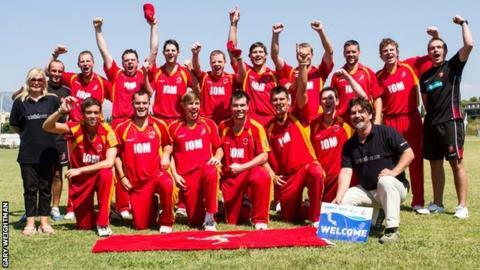 The Isle of Man have been promoted to ICC European Division One after reaching the final of the Division Two championships in Corfu. Gareth Dawson's side beat previously unbeaten Israel by 39 runs to book their place in Saturday's final and gain promotion to the higher division. Dawson said: "This was our final and it was an incredible performance." The Manx side reached 136-7 from their 20 overs before dismissing Israel for just 97. Dawson added: "Israel were unbeaten in the tournament and we produced our best performance to beat them. Hopefully we can do it again in Saturday's final but the promotion is what we wanted. "I feel like a weight has been lifted off our shoulders. We play a quality of cricket which is good enough for Division One and we should have qualified in 2010 and 2011. I think it was written in the stars that we qualified this time." The Isle of Man were struggling in their innings at 92-6 before Mark Williams smashed an unbeaten 39 of just 18 deliveries including an astonishing five sixes. Opener Gareth Morris was the island's top scorer with 53. The Manx side then ripped through the Israeli batting order with Williams and Max Stokoe taking three wickets apiece. The Isle of Man will face either Sweden or Spain in Saturday's final.